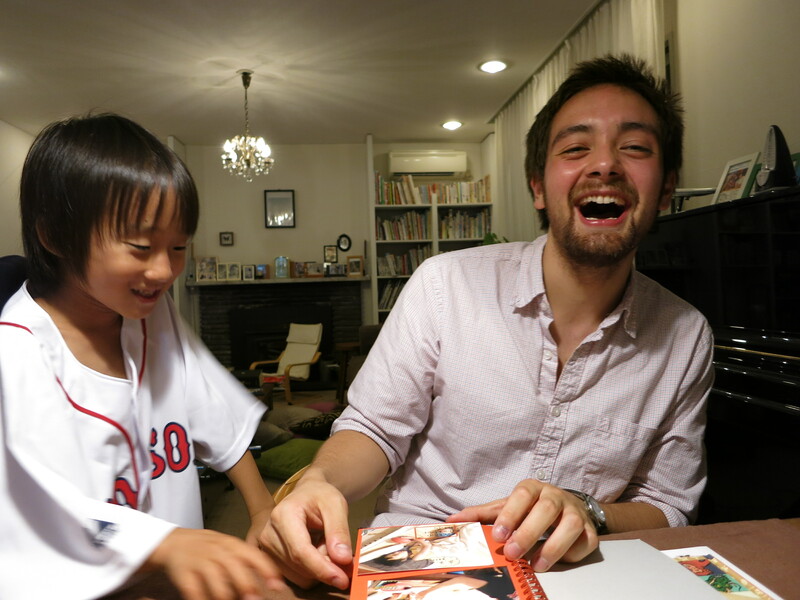 Although I moved in with my host family about a week ago, I’ve just received from my previous (host) parents a CD of pictures that they took during my time with them. 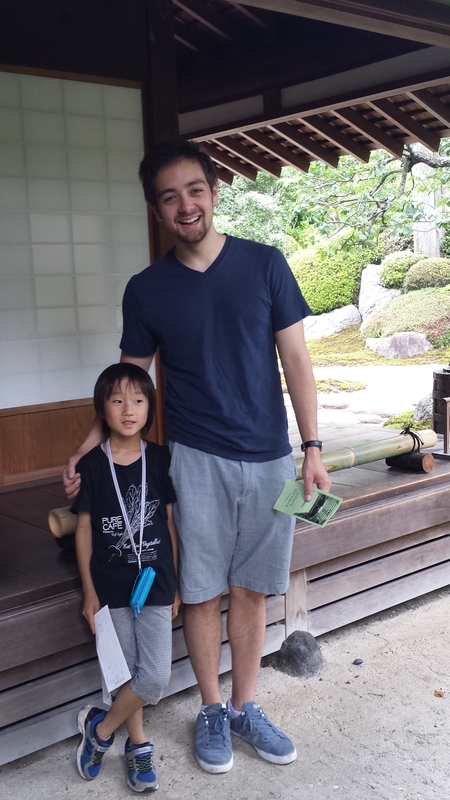 I can’t resist posting a few more here to show off my little brother, Rinta!! Also, one of the major perks of a professional photographer host-father: high quality photos. From the major gift-giving session on my last night. 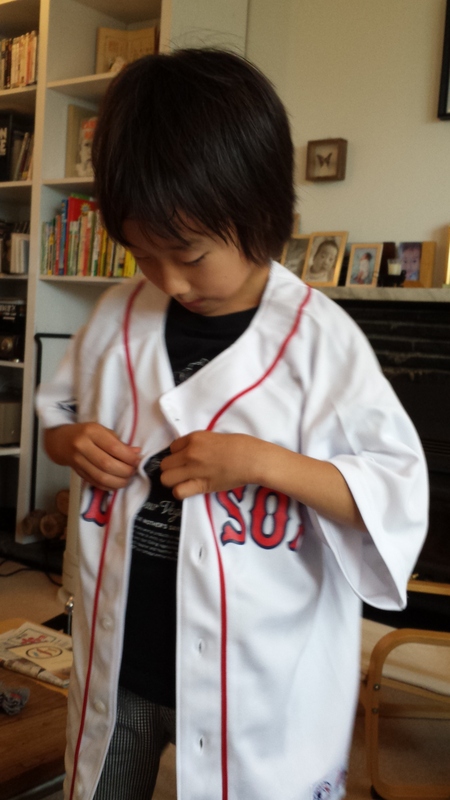 In case you didn’t notice, he wore the Red Sox jersey I brought him as an おみやげ (omiyage, a gift, usually given after traveling)! 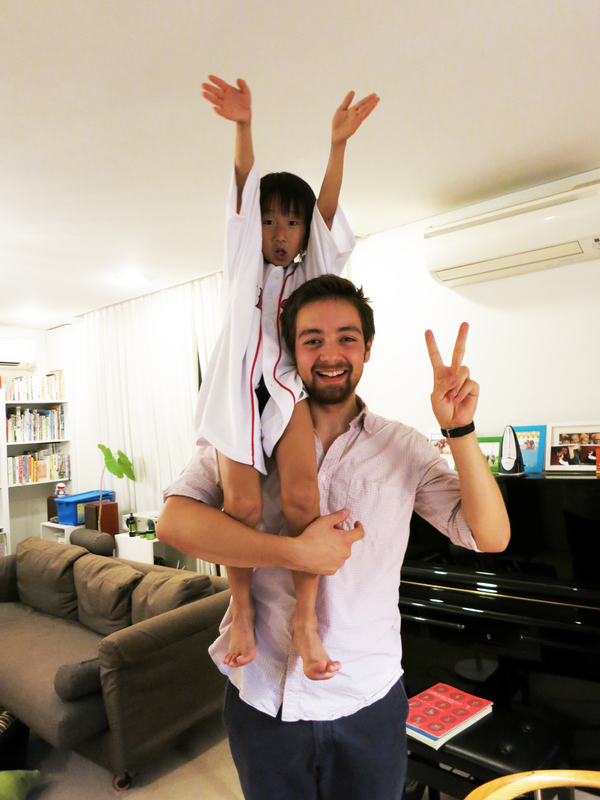 The following are a few other fun pictures from my time with Rinta and the Fukuda family. 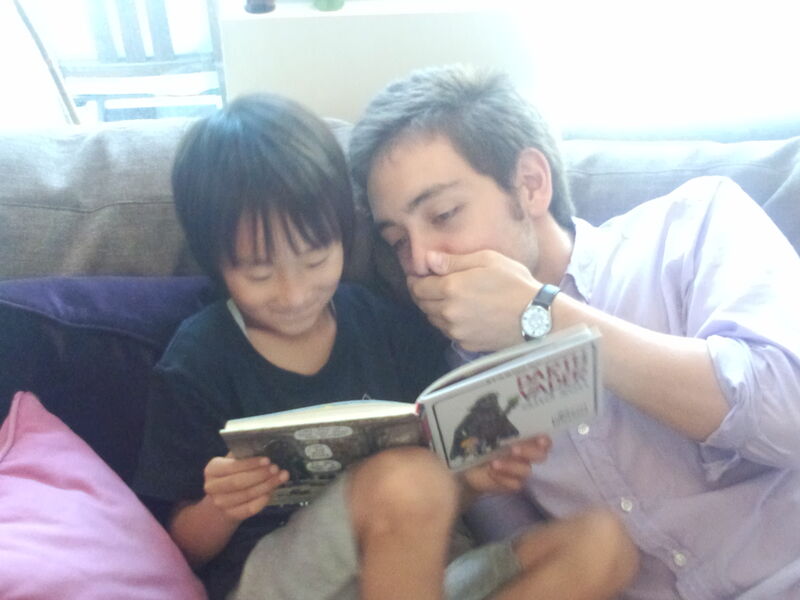 Rinta becomes a story teller upon my arrival home from work. 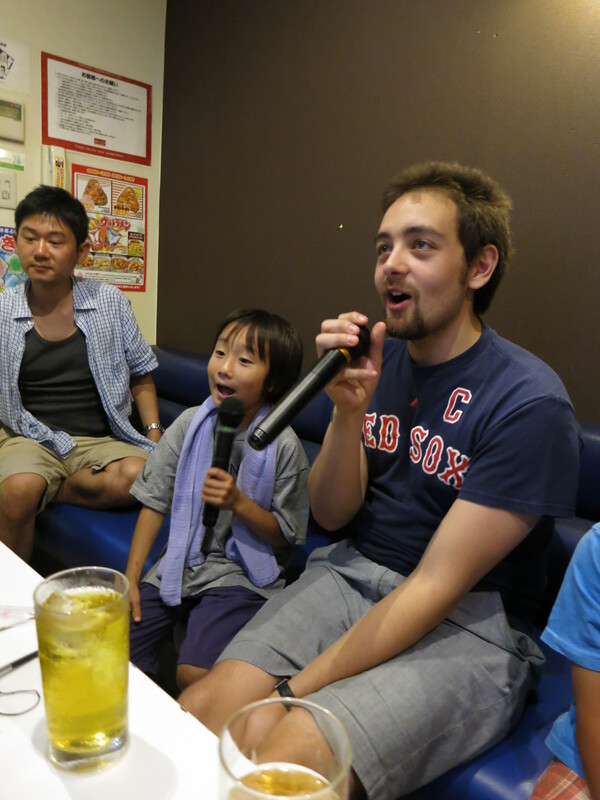 Singing Rinta’s favorite Michael Jackson tunes during my first Japanese カラオケ (karaoke) experience! 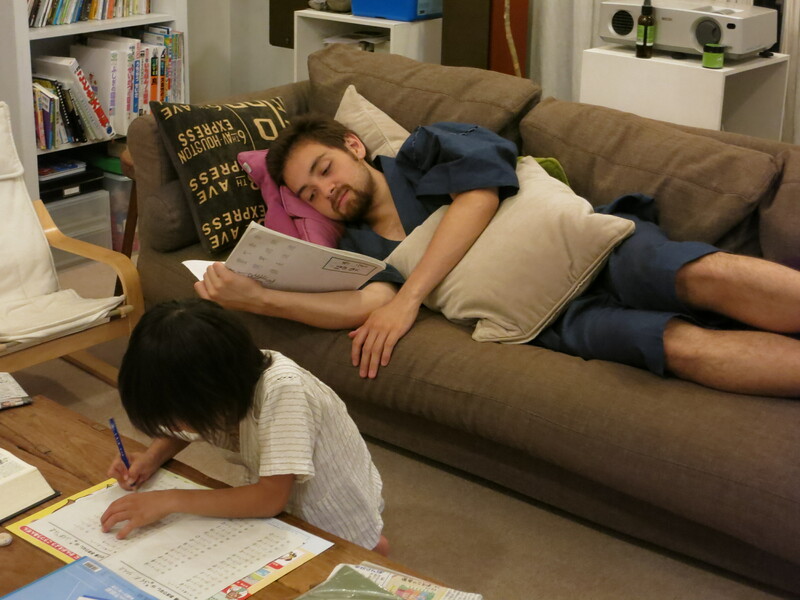 Studying together in our ゆかた (yukata, summer kimono). During my last few days, the Fukudas gifted me this beautiful blue yukata. Jeez, what a wonderful host family!! I have been very busy. 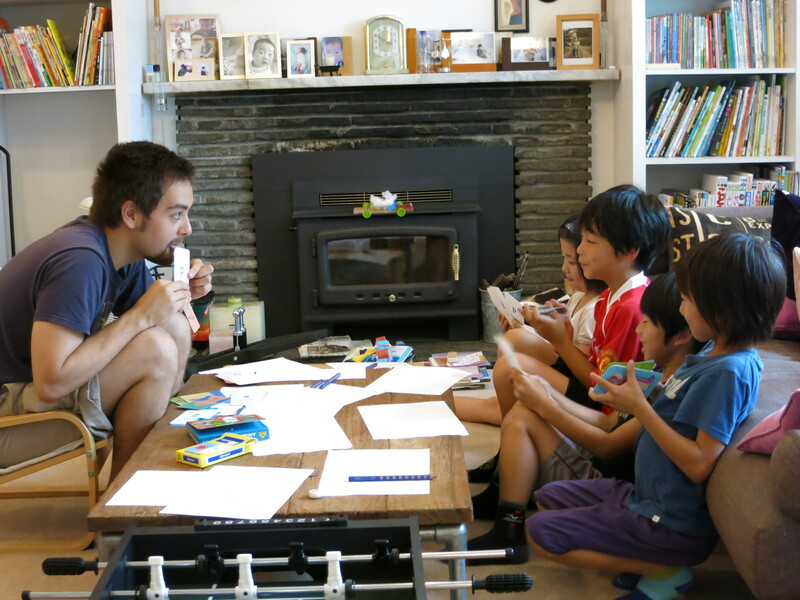 This past weekend, I moved from one incredible host family to another — from the Tsudas to the Fukudas. 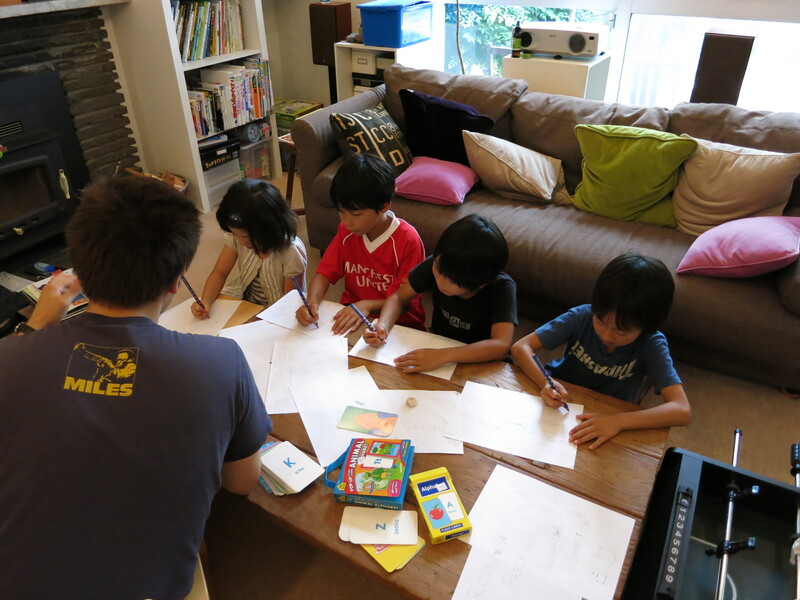 The families are quite different, mostly as a consequence of their children; the Tsudas have two late teen kids, while the Fukudas have one 8 year old son, Rinta-kun (kun is added to young boy’s names for an additional layer of fondness). AND BOY AM I FOND OF HIM!!! 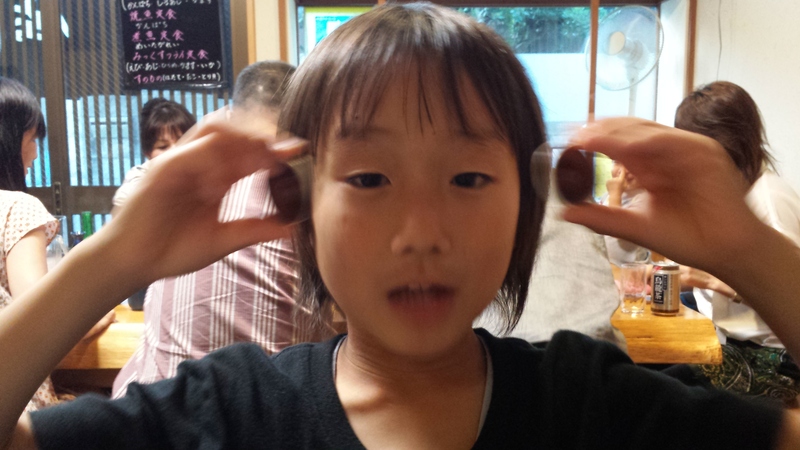 Rinta is a spectacularly smart, funny, friendly, excited boy. 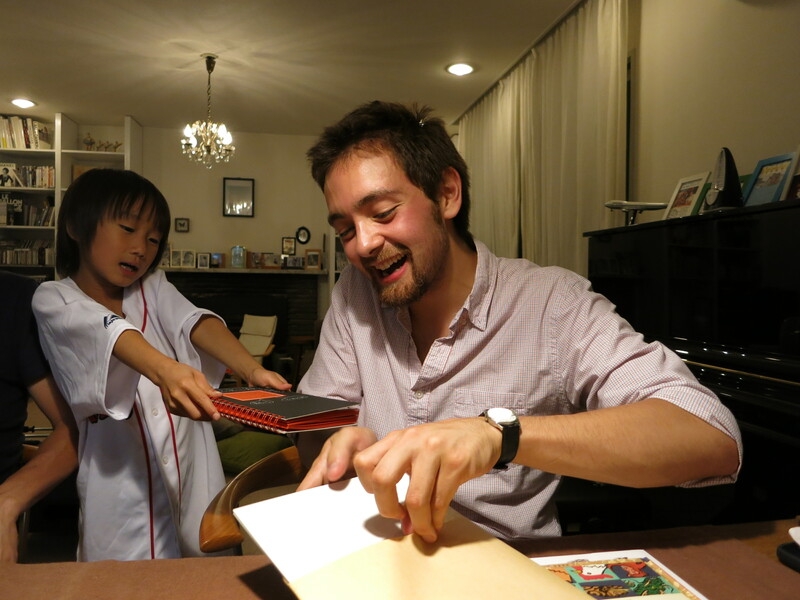 He loves loves loves taking pictures (his father is a photographer), but also has a hyper-intellectual passion for studying KANJI (the impossibly difficult Japanese writing system — non-phonetic — imported from China many hundreds of years ago). 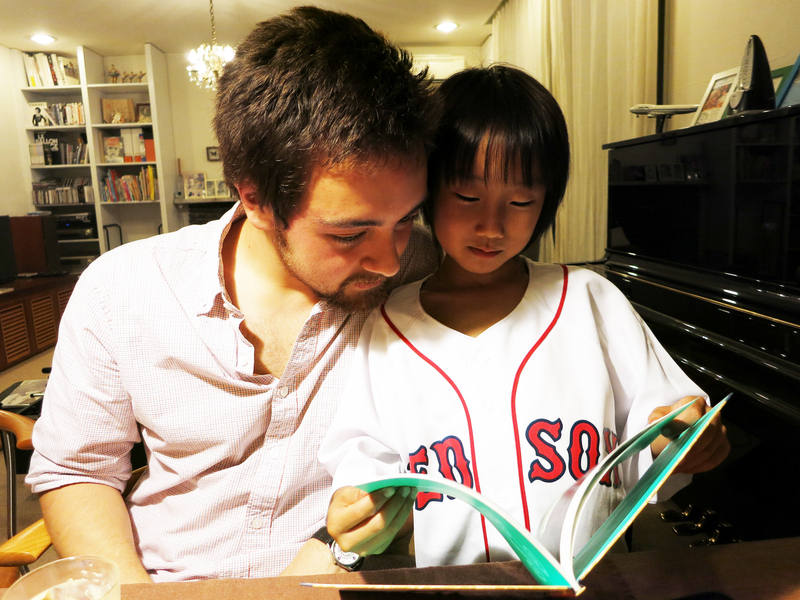 Each night, he exclaims “日本語を勉強しましょう！” (nihongo o benkyoshimasho, Let’s study Japanese!) and proceeds to methodically teach me Japanese vocabulary. 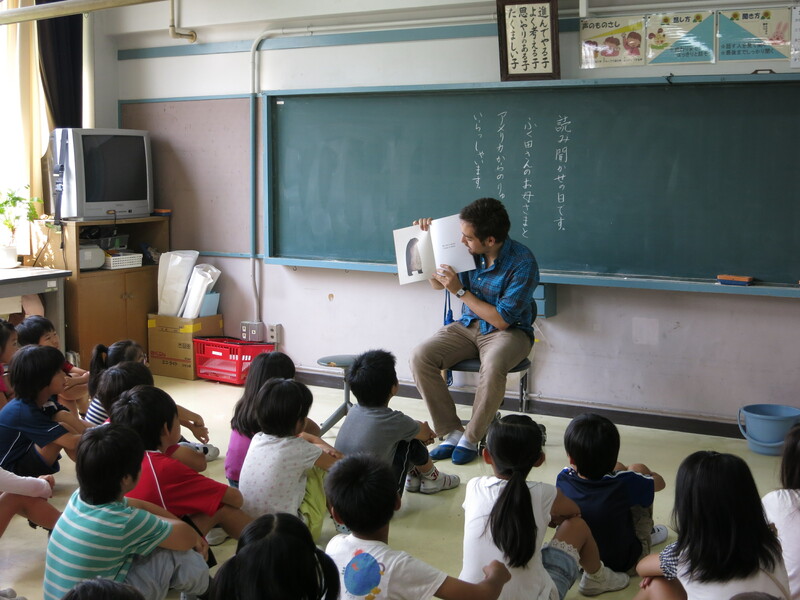 Usually the vocabulary comes out of whatever picture book or Kanji practice notebook is close at hand. I am so happy to have this younger brother for a time — although we have about 10 days left together, I’m already sad to have to leave him!! 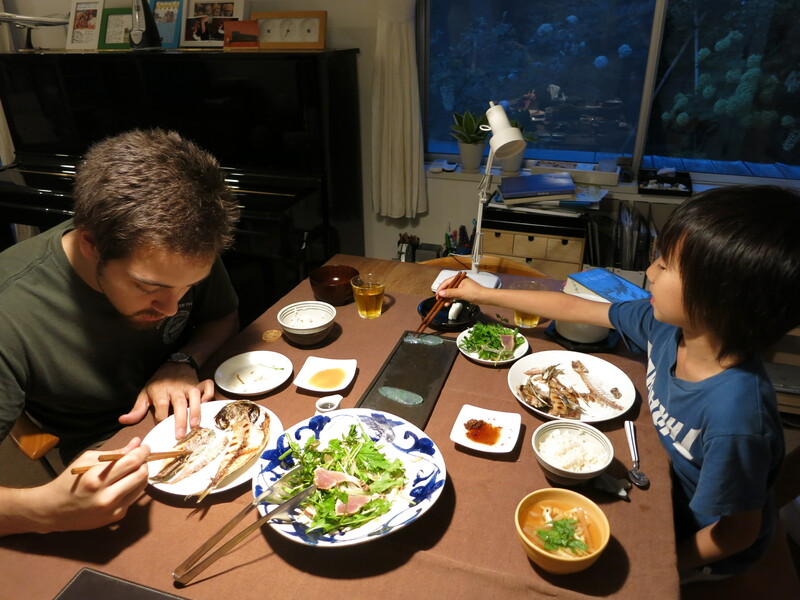 I’d also be remiss if I didn’t mention my new host-mama, Chiharu-san, who is spectacular. 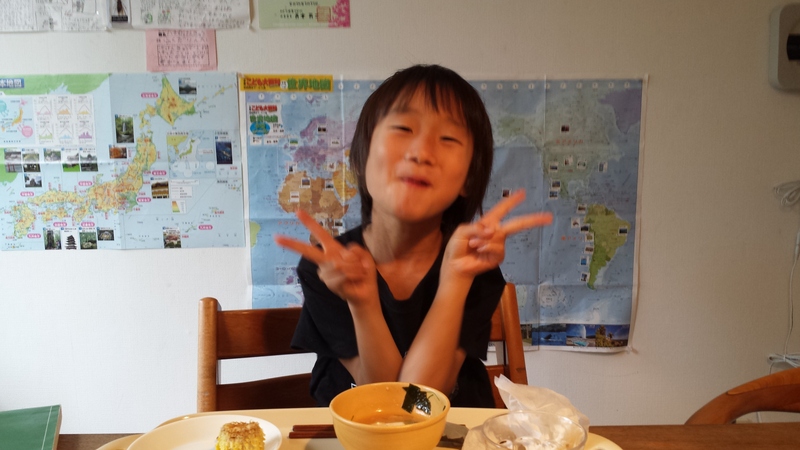 We have quickly grown close, and she is very enthusiastic about practicing her English with me too. 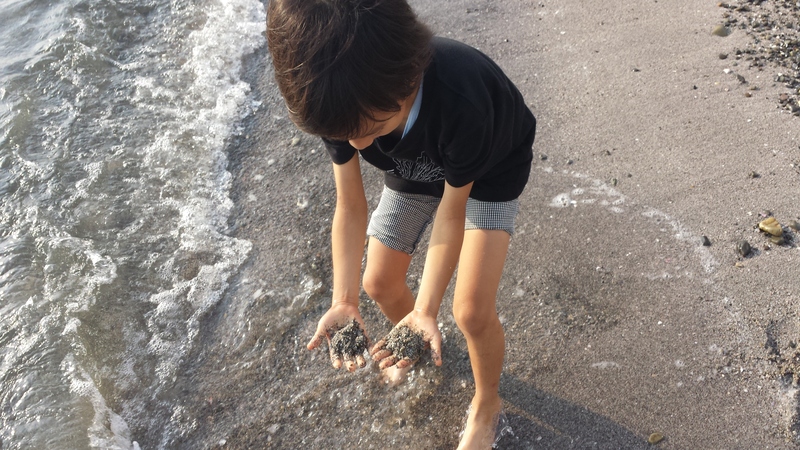 On Saturday (having moved in with the Fukudas on Friday), the whole family went on a day trip to Kamakura, an old city about 50 km outside of Tokyo. 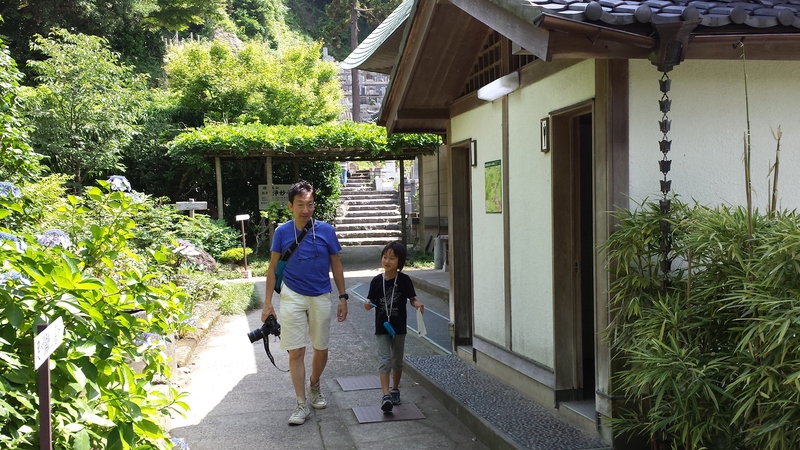 There are many old, beautiful shrines there, and the city itself is right on the ocean. We had a fantastic day of exploration and picture taking (mostly by Rinta, who took about 250 pictures over the 9 hours we were there). 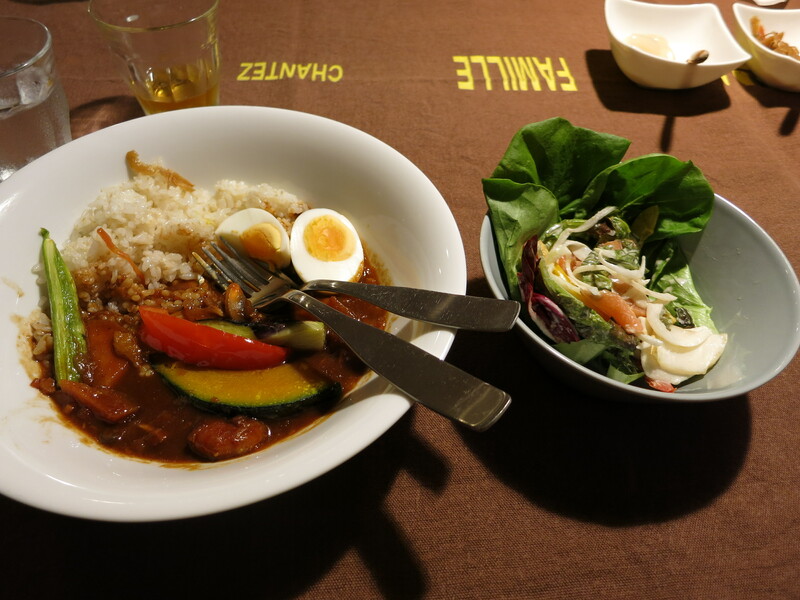 Here are a few pictures from both Kamakura and before, with a theme that I think you’ll be able to deduce…! 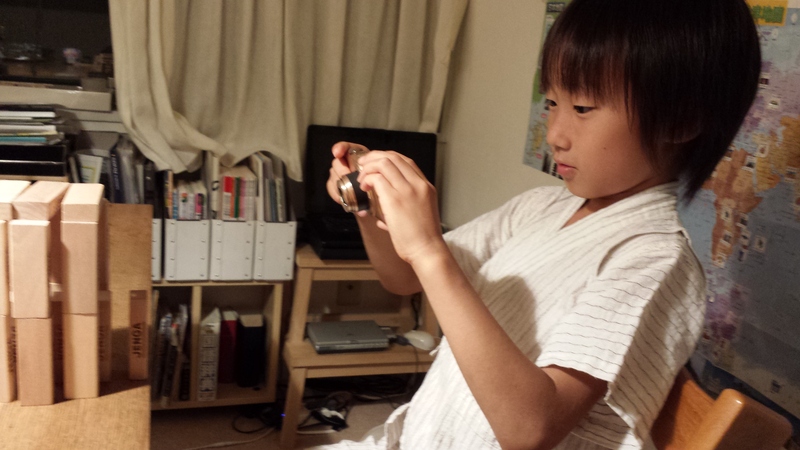 Taken shortly after Rinta-kun received his おみやげ (omiyage, gift) from me. 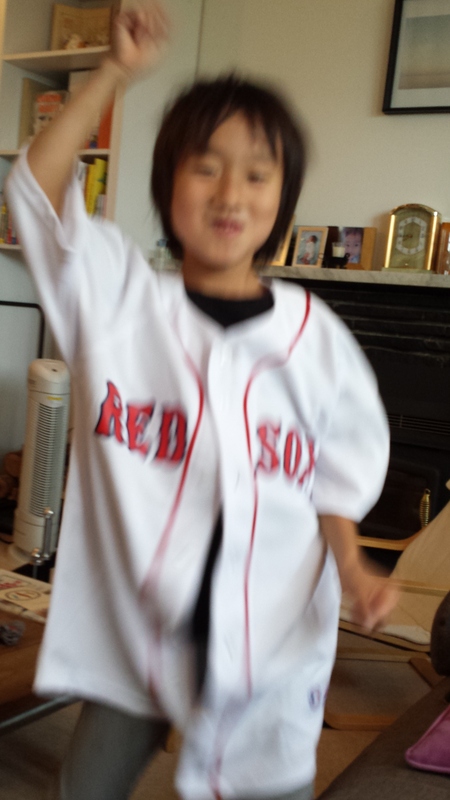 Commenced to dance to Michael Jackson, whose music he loves. We can often be found singing ‘Billie Jean’ in the living room, car, or at the dinner table. 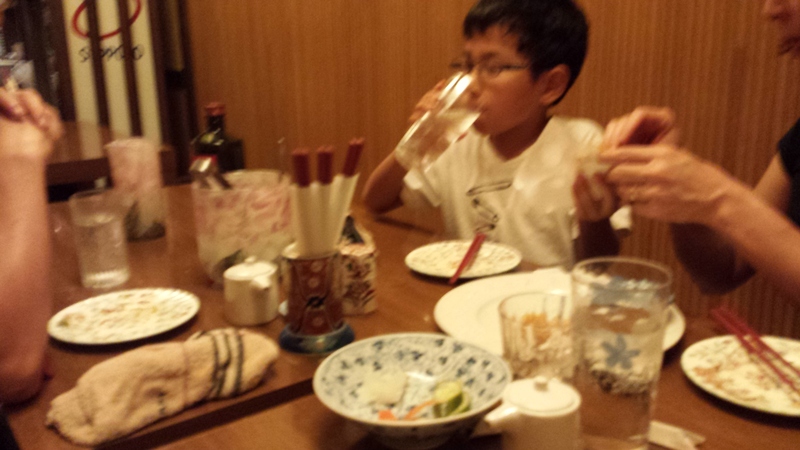 Dinner on my first night with the Fukudas. Father and son, cameras close at hand. 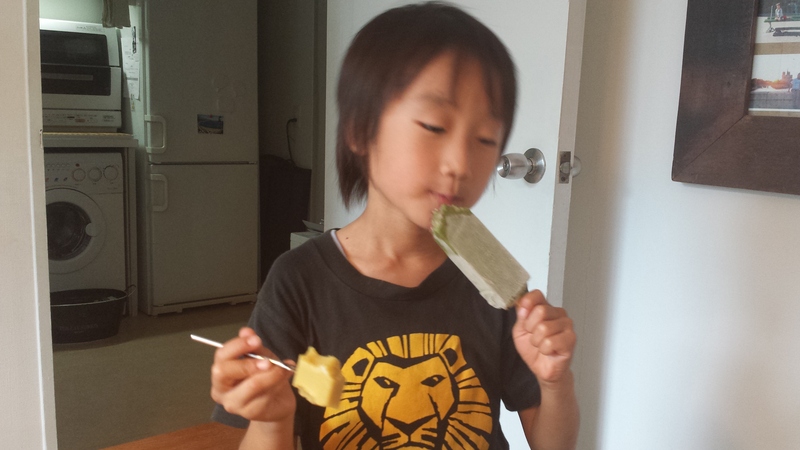 Sweets are best eaten in pairs! I feel so lucky for this experience. 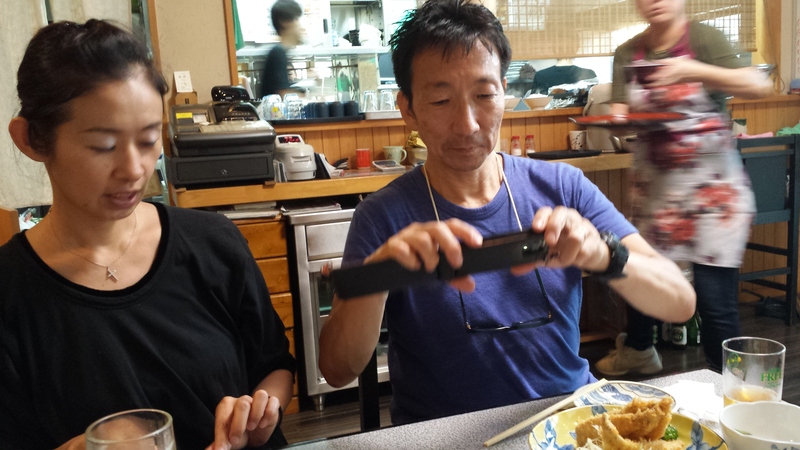 I cannot believe how warm, welcoming, generous, kind, supportive, interesting, interested, funny, enthusiastic, sweet, and humble the people are who, by some incredible twist of fate, are my hosts during this summer in Tokyo. May we all strive to act as such people for the others in our lives! This is the first post in a series of “Little Adventure” posts I’ll put up showing some of the adventures of the past two weeks. 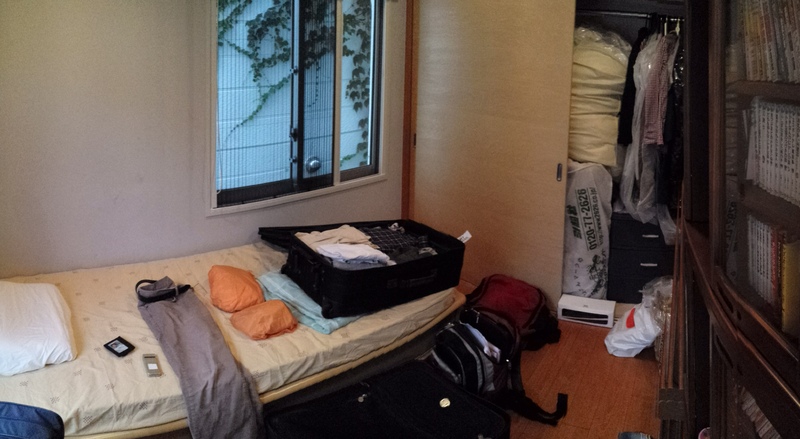 As of today (Monday, June 24th), I’ve been in Japan for about 12 full days. Thanks to an incredible host family and host-extended family/friends, I’ve met a ton of people (about 30 — I’ve been counting) and had a number of really wonderful and exciting adventures. 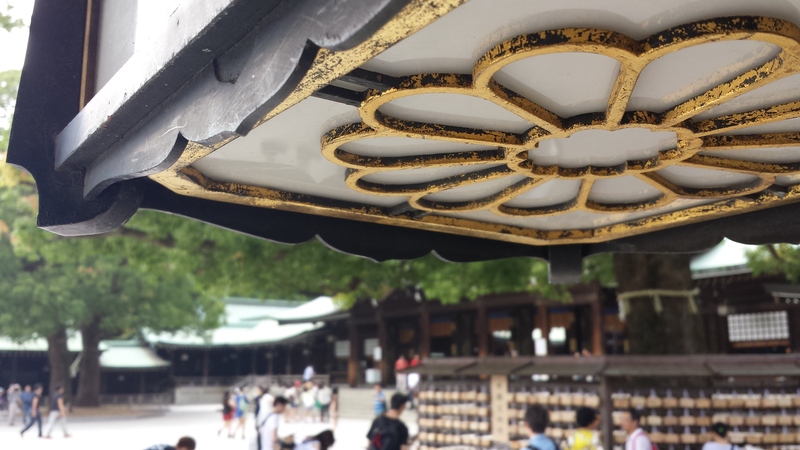 The picture above is from the Meiji Shrine, a Shinto shrine built in the early 1900s to commemorate Emperor Meiji and his wife, Empress Shōken, who were important players in the Meiji Restoration (a period in Japanese history that oversaw the emergence of Japan as a modernized nation). 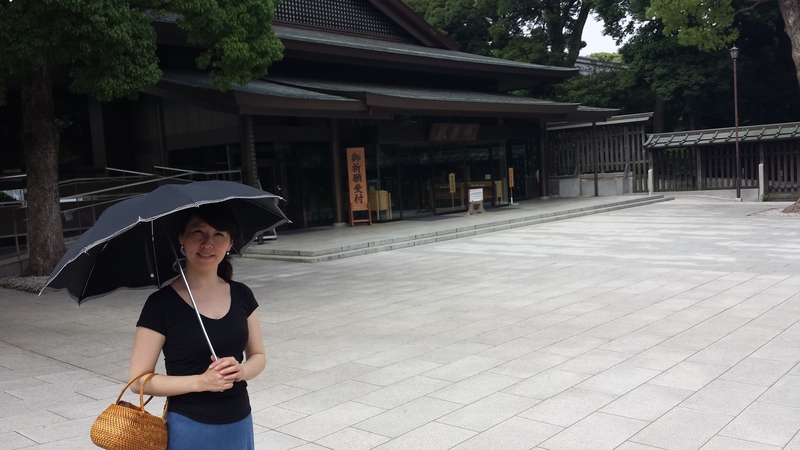 The shrine is located in Shibuya, quite close to my current host family’s house; I visited on Wednesday of last week with my host mother. Here she is! 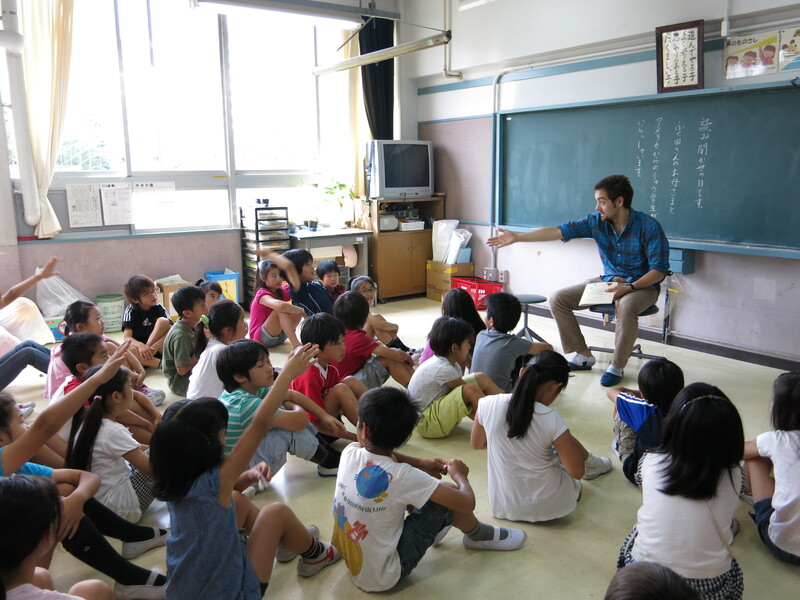 We didn’t stay for too long (I had some more work to do preparing for my English lessons the next day), but it seemed as though there were just a few main things to see. 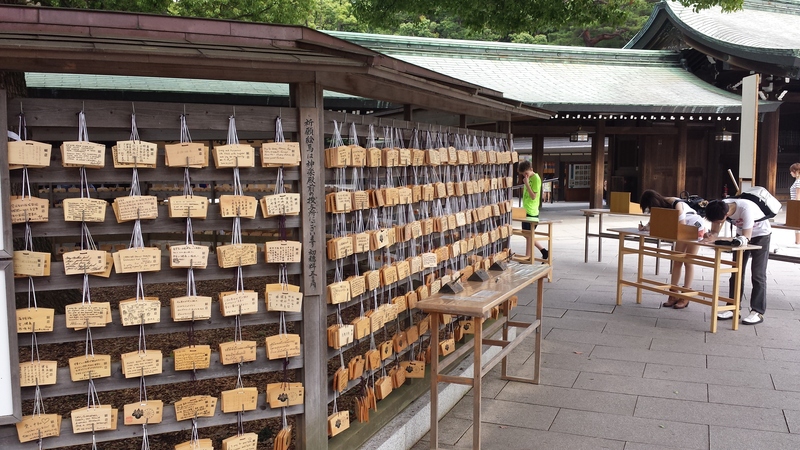 The shrine is placed within a large, dense forest area, with wide paths paved for people to walk along. In order of discovery, here are a few things we saw! A huge Pi symbol? No! 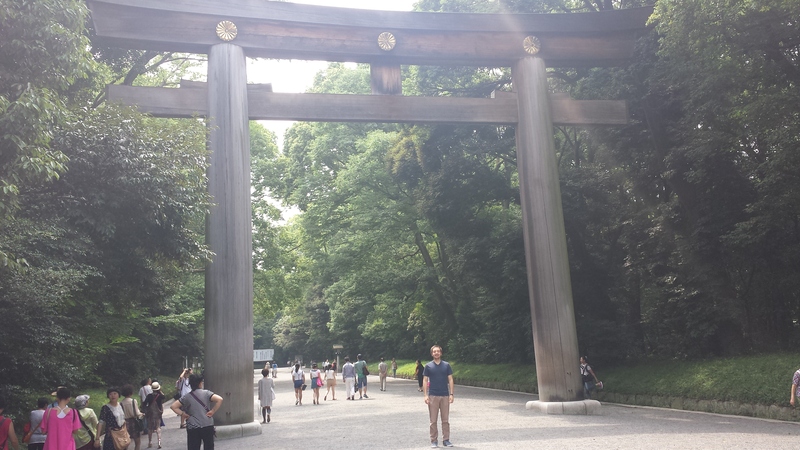 It’s a 鳥居 (torii, traditional Japanese gateway). Barrels of wine on the left, sake on the right. 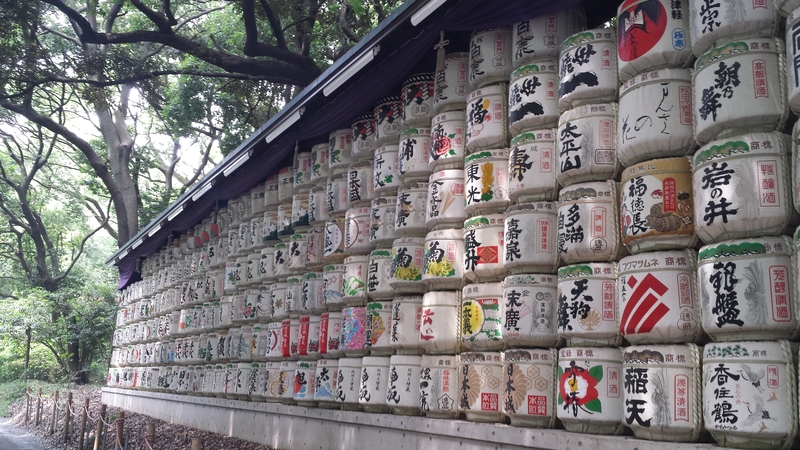 For one reason or another (religious, political, commercial — perhaps all three), Meiji Shrine attracts bountiful liquid donations from renowned distillers and winemakers around the world. 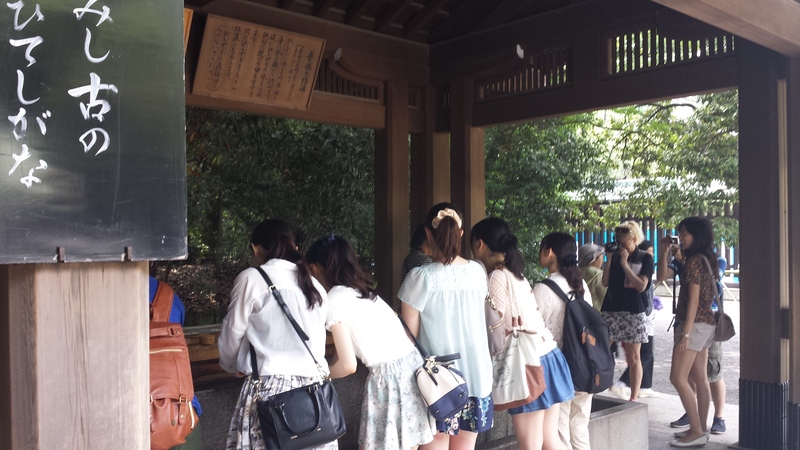 You’ve got to wash your hands using a special bamboo cup (here are a bunch of girls doing it, left) before entering the main shrine (right). 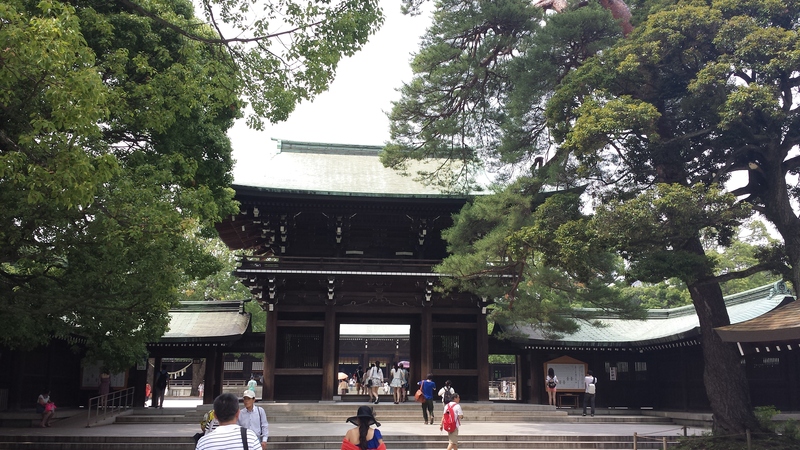 I didn’t grab any great pictures inside the shrine (no pictures were allowed at the main shrine area where people pray), but it’s essentially a large courtyard with a further, closed off area that you can look at / pray toward. There’s also an area to hang prayers cards, for a small donation of course! I have to admit that the place still feels pretty new — compared many other shrines in the world this one is very young, of course — which made it a bit less exciting to me. 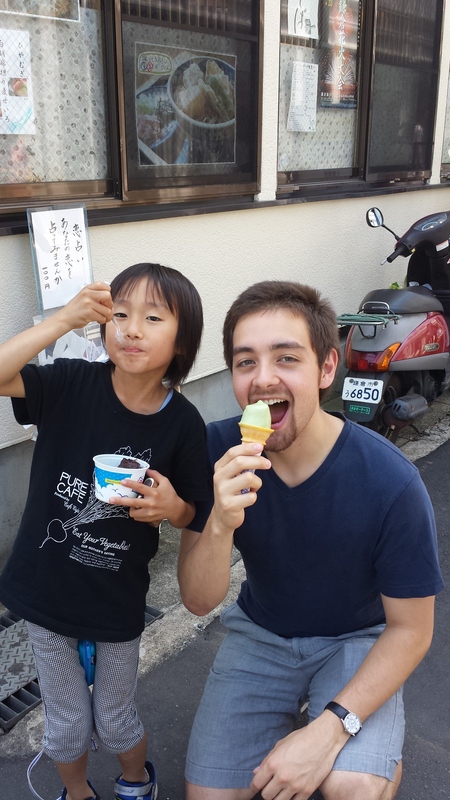 But overall, I was glad to go, and to spend some time with my host-ma!